What do prisons, prostitutes, grave robbers and evil emperors have to do with Santa Claus? You might not believe how much. As you may know, the fictional ‘Santa’ we know from songs, story books, movies and malls comes not from the North Pole but from the South of Turkey on the Mediterranean coast, where a real-life church leader named Nicholas (or Nikolaos) became famous. Born in 270 AD, Nicholas lost his parents to a plague and joined his uncle on a pilgrimage to Jerusalem and came back empowered by faith. He is said to have quieted a storm on the voyage home (thus impressing sailors forevermore) and was named the bishop of Myra as just a teenager after walking into the church, where elders had asked God to send their next leader through the door that very day. With an inheritance left from wealthy parents, Nicholas was famous for his generosity. In fact the tradition of Christmas stockings dates back to his efforts to save three sisters from a life of prostitution. Knowing the girls lacked a dowry to assure their safety through marriage, Nicholas dropped bags full of coins through their windows. When the girl’s proud father tried to bar the windows, Nicholas dropped the last gift through their chimney! 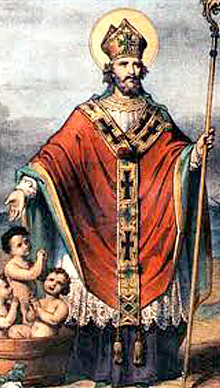 St. Nicholas was imprisoned in 303, when the Roman Emperor Diocletian formally persecuted Christian leaders throughout the empire and forced believers to give sacrifices to Roman gods or face jail or execution. Relief came when Constantine became emperor after winning the pivotal battle of Milvian Bridge near Rome against forces twice his army’s size. The night before the battle Constantine was inspired by a revelation to mark his banners and soldiers with a cross, and soon enacted sweeping reforms as the first Christian emperor. Once free, Nicholas became famous for performing miracles (including the resurrection of three boys killed by a desperate butcher) and attracting people from all over the world – even after he died in 343. Nicholas was so revered that most of his bones were stolen in 1087 and smuggled to Bari, Italy, presumably for their miracle-giving powers. Later, the rest of his bones were taken by sailors to Venice. In 2009 the Turkish government formally requested the return of all St. Nicholas’ bones from Italy, confident his remains and his miracles belonged where he had lived and ministered! St. Nicholas is considered the ‘patron saint’ of sailors, merchants, children, students, pawnbrokers and even thieves, and continues to inspire faith and generosity throughout the world. We thank you heavenly Father for the inspirational life of ol’ Saint Nicholas, our brother in Christ. We thank you also for Constantine and the many believers throughout history and around the world who have touched and shaped our world for good. Help us to celebrate the miracle of Christmas and translate its power, love and joy of it to our world today – with boldness, compassion and generosity, in Jesus’ name. Amen and Merry Christmas to all!